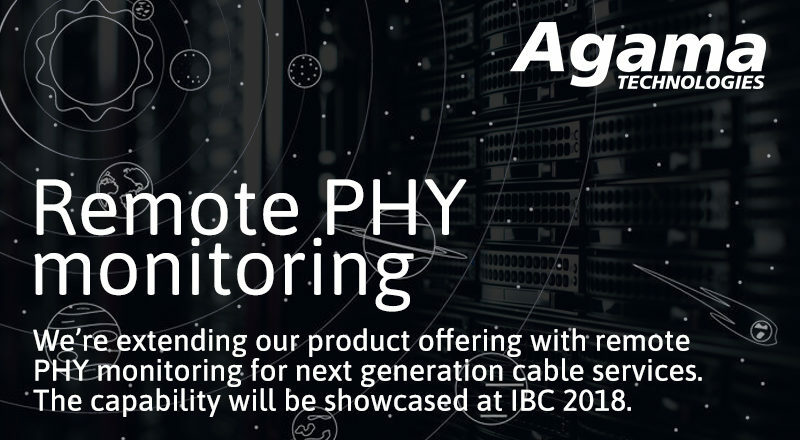 (Linköping, Sweden, July 17, 2018) – Agama Technologies, the specialist in video service quality and customer experience, today announced that the company is extending its product offering with remote PHY monitoring for next generation cable services. The capability will be showcased at IBC in September. The remote PHY architecture for cable networks has been heavily embraced by the industry and operators. Agama Technologies believes that operators need full insight into video quality and performance in their distribution chain, also in a remote PHY topology. The all new remote PHY monitoring capabilities of the Agama Analyzer give full insight into the DEPI streams, from the CCAP core towards the remote PHY, ensuring that any issues in stream or content integrity can be detected. “We are proud to introduce the first remote PHY video monitoring solution on the market, with the new DEPI add-on functionality in the Agama Analyzer probe product family. This offers full transparency of the video traffic, from the CCAP core to the remote PHY device, for next generation cable services”, says Johan Görsjö, Director of Product Management at Agama Technologies. The new Analyzer probe offers detailed metrics of the DEPI layer, as well as deep analytics and insight into the video streams transported in the DEPI tunnel, enabling correlation of video performance before and after the CCAP Core. With powerful visualization and alarming, the Agama Analyzer is the right tool for assuring stream quality in modern cable deployments. The DEPI Analyzer probes are already deployed with leading technology vendors and in live customer cases, proving to be extremely useful in testing, deployment and in live operation. Agama Technologies believes that early adopters of the remote PHY technology should take extra care and ensure that they have the right quality assurance and monitoring tools in order to gain full insight into all handover points in the delivery chain. This will help operators to speed up their deployment of new technologies like the remote PHY and avoid impacting the end-customers.